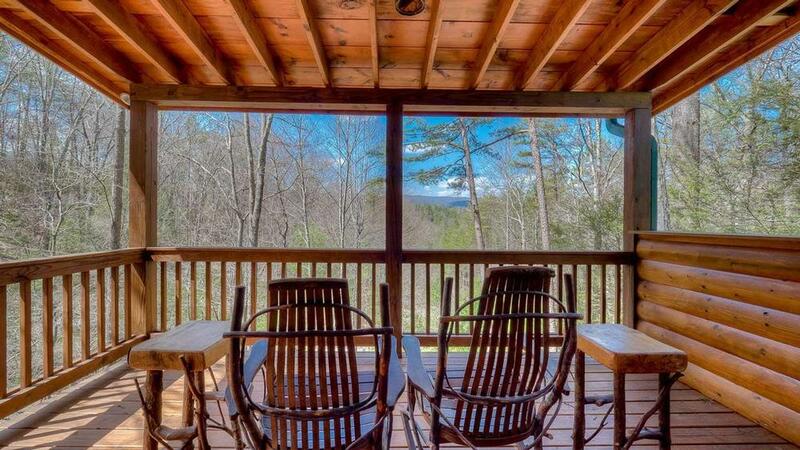 If you enjoy living the 'Wilderness Way', then this woodsy, artistic lodge is a definite standout among Blue Ridge mountain cabin rentals. 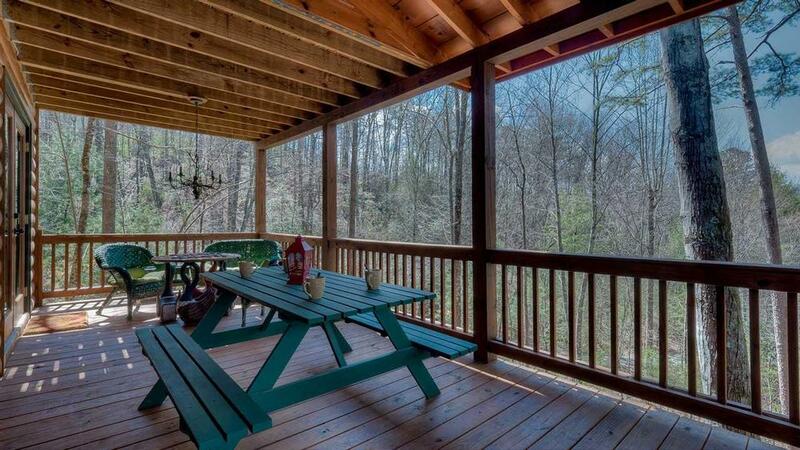 It's not only private with a great mountain feel, but its location is a perfect base camp for land and river-based adventure, or shopping and scenic attractions in downtown Blue Ridge. The outdoor stone fireplace and cherry red Adirondack chairs at the front entry invite gatherings of friends and family on chilly nights filled with fresh mountain air. And with double glass doors exiting every room and many outdoor seating areas overlooking mountain views, guests will be drawn outside day and night. Get a fire going, make some hot cocoa and gather 'round for nights filled with lively conversation. With so many great adventures to be had, get up early to make the most of each day. Bring all of your outdoor gear and spend days hiking, kayaking or canoeing, tubing and fishing, camping or backpacking through the hills. Back home, make a pot of piping hot chili for everyone to share at the dining room table, out on the picnic table or any of the seating on the deck. 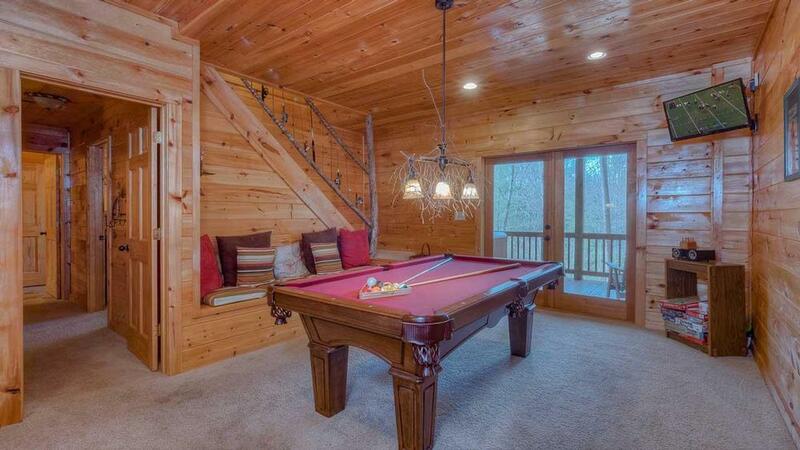 Downstairs in the game room, make a drink at the bar then play pool under the rustic twig chandelier, or play a round of darts. The kids can also have fun playing board games until bedtime. Then they can snuggle into the adorable bunk beds nestled into the bedroom just off of the game room. After they're tucked in, step out to the luxurious spa on the downstairs deck. A nighttime dip will continue to melt away your everyday concerns and remind you how nice it is to get away for a while. 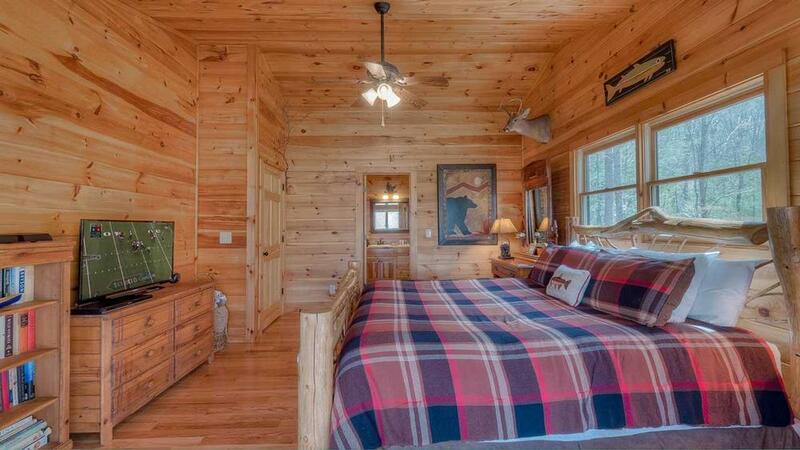 The cabin's layout is perfect for gatherings but offers private areas and bedrooms when social time is over. Upstairs in the king master suite, spend a few moments sitting out on the balcony under the moonlight. You can also retire to the queen bedroom either on the main floor, which has its own Smart TV, or downstairs, with its own Jacuzzi tub as well as unique rock wall and flooring. Whether it's cozy plaid bedding, a fishing theme or cheerful quilts, each room has its own charming, rustic personality with custom log furniture. For early risers or night owls, the artist's gallery in the loft space is a creative haven. Feeling inspired from your time out in the woods, spend some quiet time drawing or writing while the rest of the house sleeps. Take the road less traveled. Here in this lush, leafy setting and authentic, woodsy cabin, you'll feel connected to nature, inspired by its beauty, and right at home living the Wilderness Way of life. 12/18 - Clean, well equipped with necessities in the kitchen, plenty of blankets & towels, TV’s & sound bar. Professional - quick response to calls & emails - that’s very important. Reasonably priced. 12/18 - It was easily accessible to the town and stores. Grocery and Walmart less than a 20 minute drive. 10/18 - The location was great! The updated appliances & the fact that it was in a quiet location. 07/18 - Beautiful setting, comfy and appropriate decor, great amenities! My kids LOVED the hot tub and pool table. I LOVED the 3rd story deck with its gorgeous view. We truly got to enjoy our time at the cabin because there were so many fun things to do! Fast, friendly service. We booked our cabin the day before we needed it. So impressed with the helpful staff and quick response so that we could make our vacation a reality. 10/17- The peacefulness, the amenities, the close proximity to activities yet far enough off the beaten path for privacy. Very good, professional and affordable. 08/17- The cabin was gorgeous, I have stayed at Wilderness Way in the past so I knew what to expect. 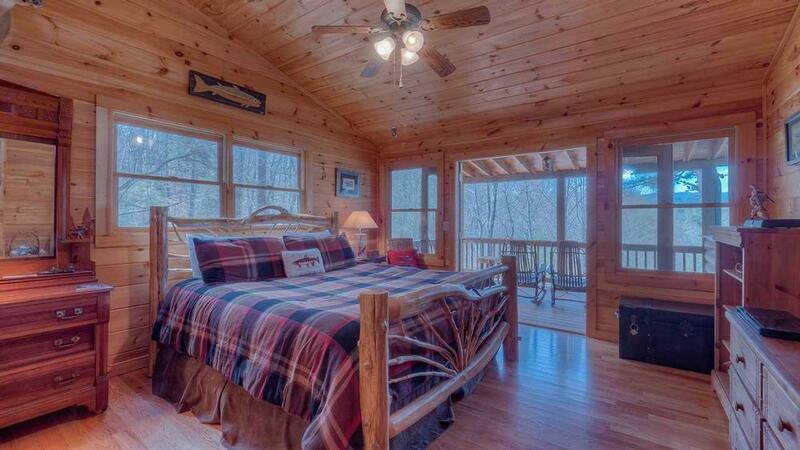 I love that this cabin is set so that you have total privacy from the deck and a beautiful view. As I have said before you have great properties, every cabin I have ever stayed in was beautiful and well maintained. 08/17- Beautiful cabin, having a grill was great and a game room. I've rented a cabin for the last two years and will continue to do so. We had a great time. 06/17- The decor was nice and really added to the overall experience. The kitchen was well equipped with cookware and utensils. The linens and towels were nice also.We enjoyed the hot tub, the game room was nice. I thought you all did a fine job, I will definitely do business with you again. Thank you all. 05/17- The cabin is beautiful, and the area is really nice and quiet, it is the perfect place for a wonderful vacation with family! We love it. Very good company, and helpful with any question! 01/17- It was extremely clean and well stocked, and the hot tub was especially clean. 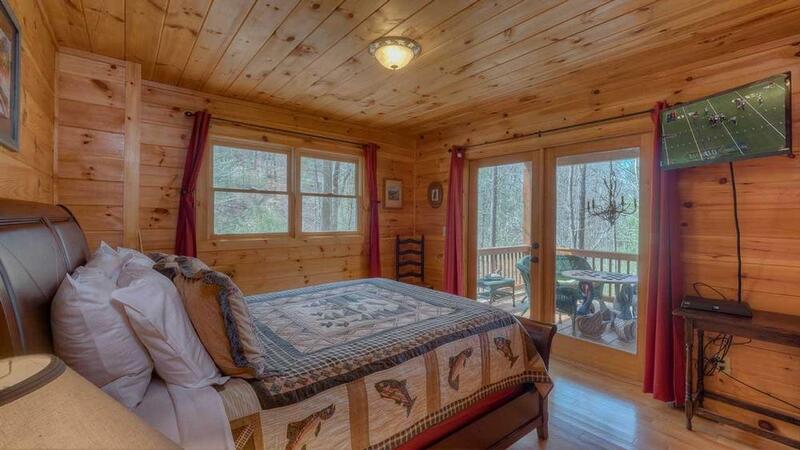 We love Escape to Blue Ridge- we have rented from you many times in the past, and we will continue to do so. We have recommended you to MANY of our friends and family! 12/16- Beautiful home!! Fully stocked, everything you need! Beautifully decorated, loved the small details. Newest appliances and technology (wifi, Netflix, pairing to other devices capability). Overall great experience! Wish I could stay forever! Very professional staff! Prompt emails and phone calls. Loved the follow up emails. 11/16- We loved everything about the cabin, the location, the pool table, darts, hot tub, we even played checkers out on the porch There are 4 outside areas to sit and relax. The cabin had everything u could possibly want!!!!! Very nice staff !! They took care of getting us the information we needed for the cabin!! 11/16- Easy access to the cabin. All amenities are provided. The home is beautiful. Loved that all the bedrooms had TV's with cable. All the staff at Escape to Blue Ridge are so easy to work with, very helpful, friendly and knowledgeable about all the cabins. This is why we use this company every year, the best in North Georgia! 11/16- Decorated very nicely. Very enjoyable. We have booked a cabin with you guys for the past 5 or 6 years and we see the company getting better every year. 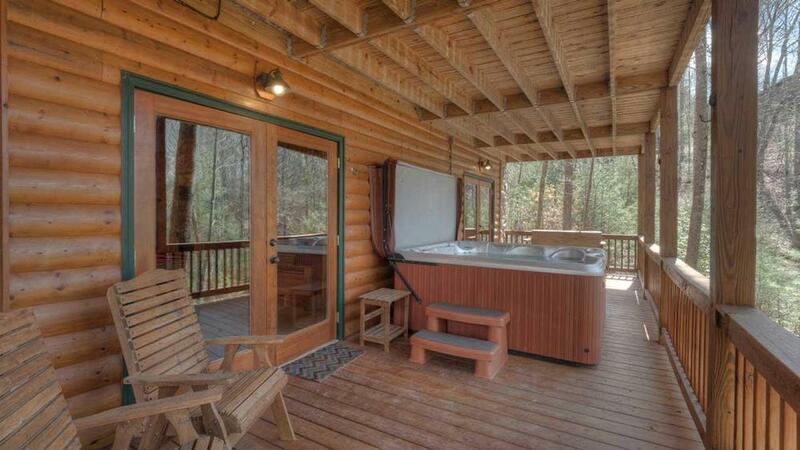 11/16- Loved the porch fireplace, hot-tub & pool table. The cabin layout & decor were very enjoyable! Very friendly & professional staff! 10/16- The outdoor fireplace was great, comfortable furniture, kitchen well stocked, decks roomy and had a good view. Very efficient and responsive staff. Directions were good. Will use you again. 08/16- Clean, spacious home with nice amenities, such as hot tub, pool table, dart board, lots of TV's, board games. 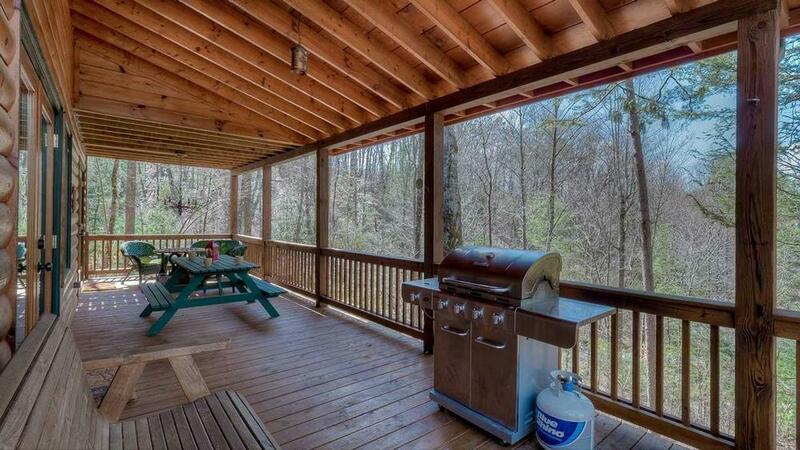 Has nice porches, grill. Located in a quiet wooded area. Doesn't have much of a view, but that's ok. The guide book about the home and things to do in the area was the best I've ever seen in a rental. 08/16- EVERYTHING! Very spacious! 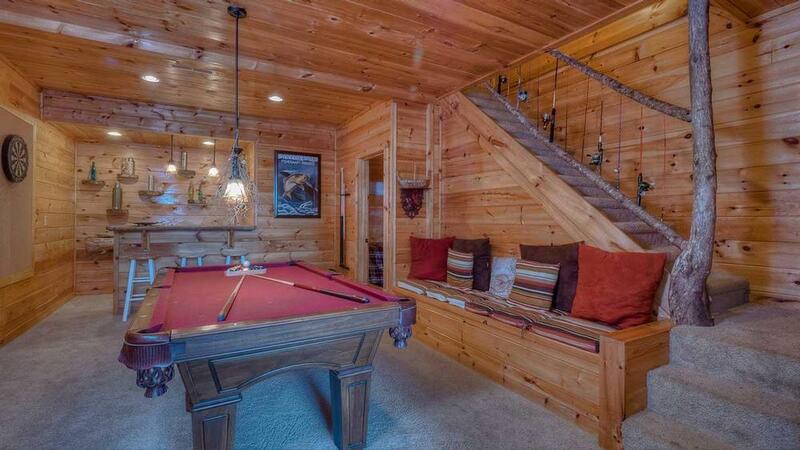 Favorite part was the Billard room on the first floor! 07/16- The home was in a wonderful convenient location. Only 10 minutes from the grocery store and a short drive to hiking and white water rafting locations. It was also in somewhat of a "neighborhood" I use that term loosely because we could not see the other homes around us but there was a paved drive to the home and the home also had a paved driveway. Inside the home it was very nicely decorated. The bed were very comfortable as were the sheets. The home had all the kitchen utensils needed which was a nice surprise. And the hot tub was wonderful especially after a long day of hiking. We loved this home and hope to rent it again. We love Escape to Blue Ridge. My husband and I have rented from here many times and will continue to do so. We recommend you to everyone. Thanks for being so attentive and wonderful. 06/16- This cabin had everything. I made my famous pound cake for my brother and the cabin even had a hand mixer. It was quiet, relaxing and even though there were cabins nearby, we felt secluded. 03/16- Wilderness Way was absolutely beautiful! The log was comfortable, had a kitchen and bathrooms with all the amenities I expected, and the bedrooms were very comfortable and nicely furnished. The internet and televisions worked great (which I wasn't honestly expecting being in the mountains) and the jacuzzi with a beautiful view of the mountains was SPECTACULAR...I could have spent all my time there. It was wonderful and we are already excitedly planning to go again. 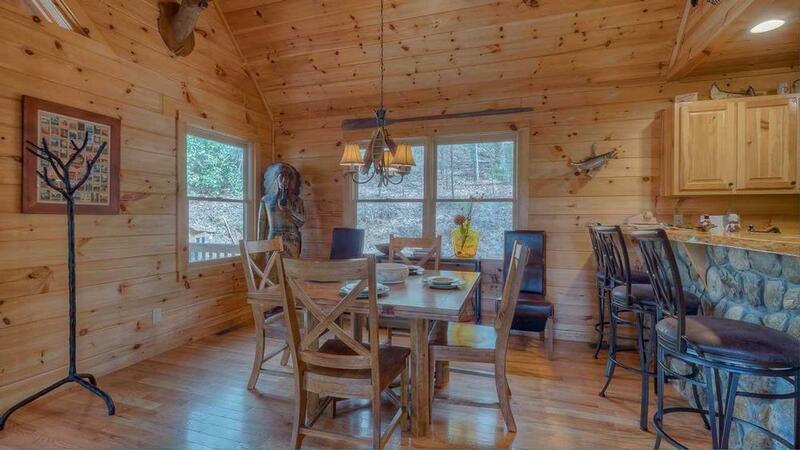 02/16- Beautiful cabin . It is so close to our favorite restaurant and tubing etc. We love the company and have booked our family vacation for the end of July. 02/16- No surprises, cabin was exactly as pictured and described..... Very impressed with the stocking of the kitchen, we have stayed in cabins all over and always end up having to purchase a pan or pizza cutter or something, NOT the case with this cabin, it was PERFECT!!!! Reservations were easy and staff friendly when we called for a late check-out. 01/16- Conveniently located to town and surrounding outdoor activities. 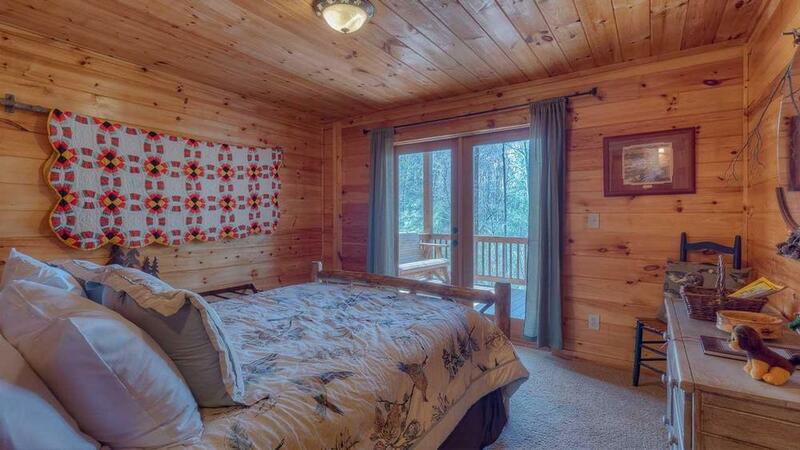 01/16- This cabin rental far surpassed any we have ever rented before! It has beautiful mountain views from all three levels and each level has a bedroom and private bathroom with a Jacuzzi tub downstairs. The pool table room and bar with huge hot tub just outside glass double doors were fantastic! 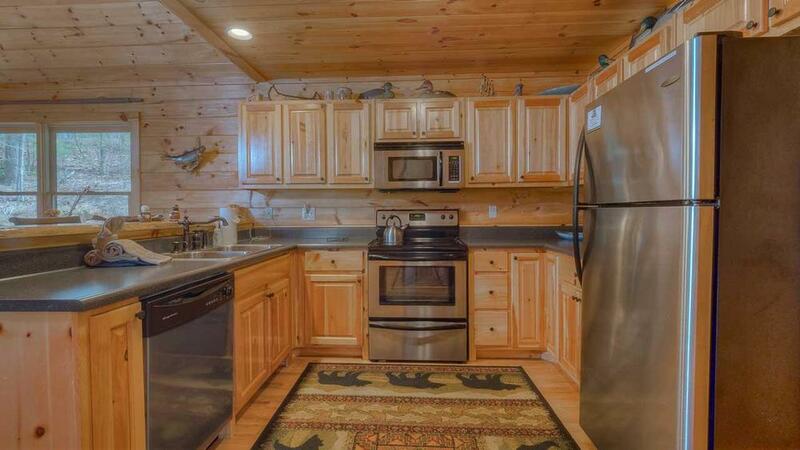 We loved the decor of the entire cabin and the kitchen was stocked with every size pot or pan you could ever want! We enjoyed making a wood fire on the porch as well as utilizing the gas logs inside. This cabin was perfect in every way and we thoroughly enjoyed our stay! Every person I spoke with or emailed gave excellent customer service and I greatly appreciate that! Thank you very much! 11/15- The kitchen was well stocked with utensils and cookware. The hot tub was well kept and clean, beautiful layout and beautiful area. I was happy with the reservation process. We have been taking family vacations to many different places over the last 10 years and by far the process with "Escape to Blue Ridge" was the smoothest. Thank You. 12/15- The cabin was exceptional! Easiest check in ever. 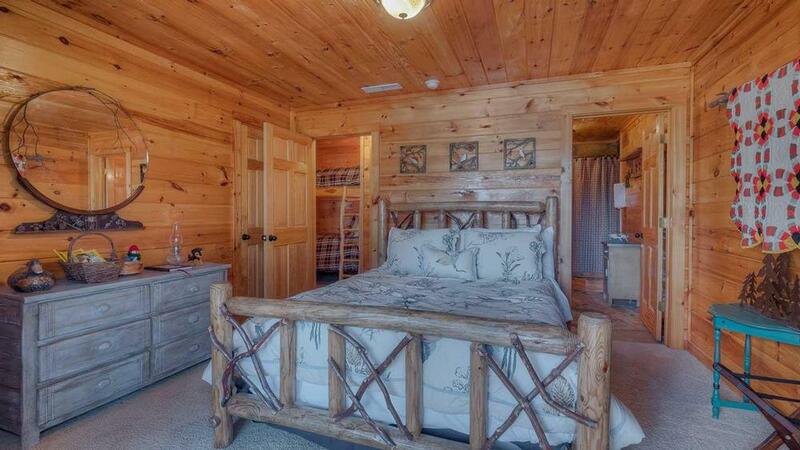 11/15- The cabin was very beautiful and the scenery was awesome.The beds were so comfortable and decor was so nice. This is my second cabin I have rent through this company and I have received great service from everyone. I was impressed when I called with questions about an issue how helpful the associate was. 07/15- What a beautiful retreat. It's tranquility was soothing and suited our family's needs perfectly. Ages ranged from 5 to 83 and all were so relaxed and happy to be there. Top notch. I would most definitely use your company again. 07/15- The home was GORGEOUS!!!! Wilderness Way was beyond anything that I could have imagined!! The amazing woodsy decor really made the feel of the home that much more cozy! It was very well equipped and spacious. Leaving was incredibly difficult because we loved being there so much! Thank you for being incredibly accomodating and opening our home to us! 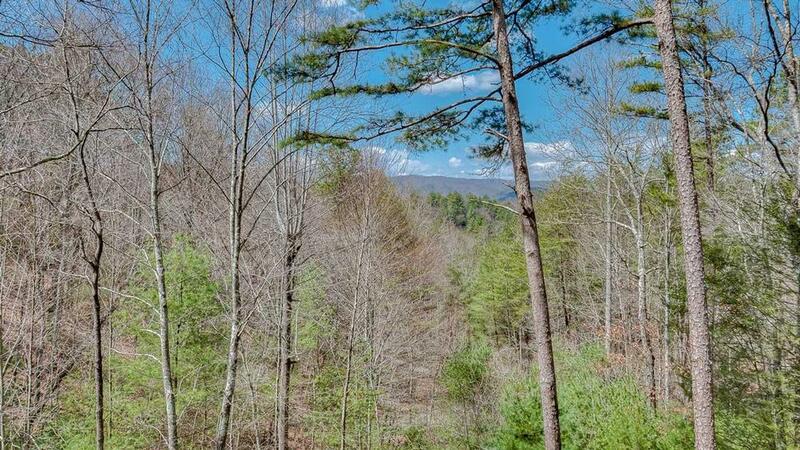 05/15- Convenient location to hiking and about 10 miles from town. 0.8 miles to the riverside restaurant. 03/15- It was most peaceful and quiet. 11/14- The quietness of the area; the furnishings were comfortable; the view; cleanliness; the outdoor fireplace. Loved it!! Very good company. Very responsive and seemingly on top of things. 10/14- Inside fire place that wAs gas and therefore easy . The bedrooms and bath on each level were excellent. Really appreciate the welcome book with suggestions of places to go And things to do. Very much enjoyed our stay and will use Escape to Blue Ridge again. 09/14- The cabin was beautifully decorated!! 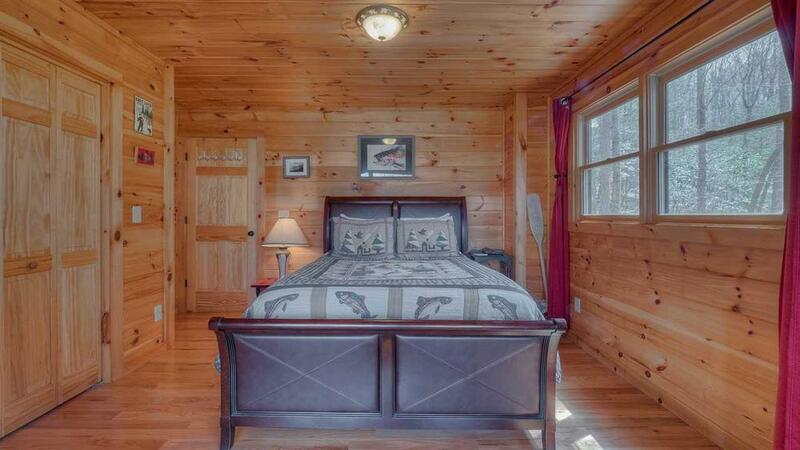 The layout of the cabin is perfect and has all the ammenities to have a wonderful vacation. I really appreciated how the kitchen was well stocked with utensils, pots and serving pieces. The process from booking the cabin to receiving all the contact and direction info. to the cabin was easy and very professional. I appreciated all the help and sincerity from the employees that answer the phones. 09/14- It is in Blue Ridge and close to many great things to do - hiking, horseback riding, kayaking & paddle boards, Calvary Chapel Blue Ridge, ATV rentals, and gorgeous waterfalls. 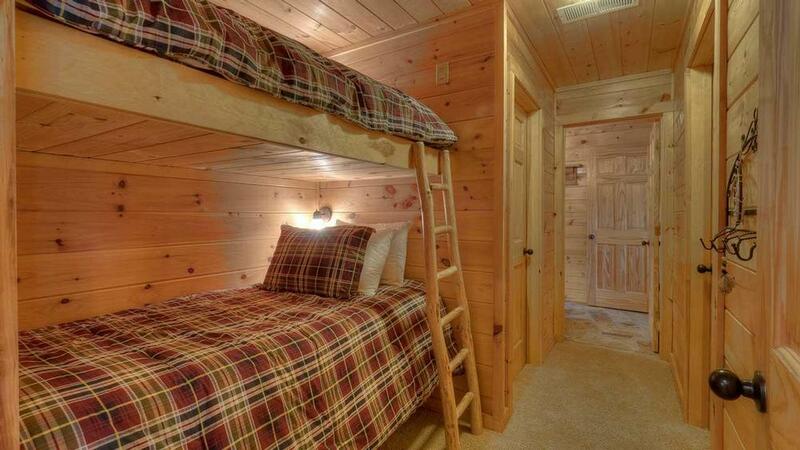 The design of adding bunks to the downstairs hallway is a nice idea. Everything about this home was exceptional. It is nicely appointed in furnishings, decor, kitchen, and amenities. The hot tub was so nice and we enjoyed the room available on all 3 levels, including balconies. The beds were very comfortable and linens above average. 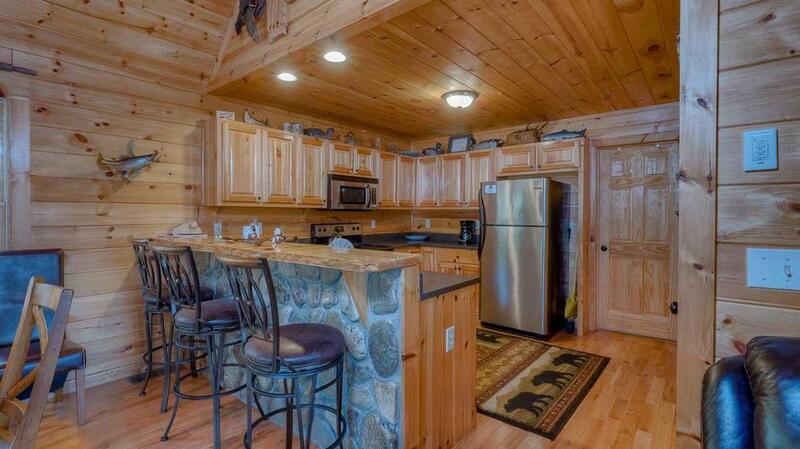 7/19/14 Cabin is in a great location near to activities and amenities. Easy to get to. 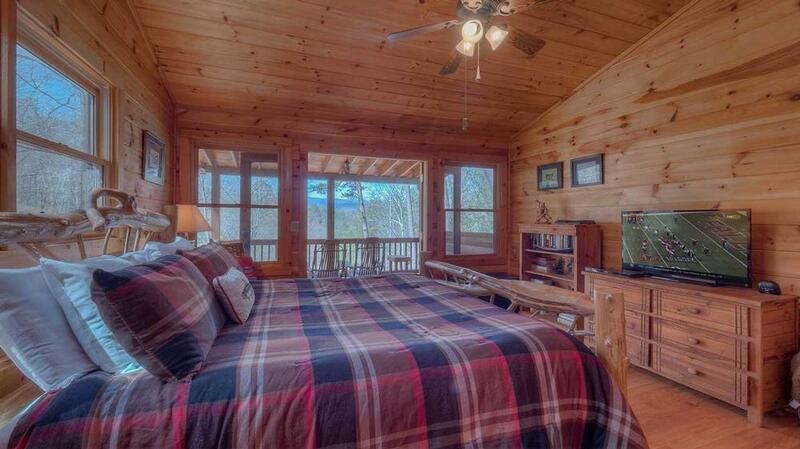 Beautiful, comfortable, and provided a peaceful atmosphere to relax and enjoy the mountains. We definitely look forward to another stay here. Great to work with. Kept us informed, provided directions and access code to cabin well in advance. Cabin was extremely clean and well maintained. When minor service was needed response was immediate. In all ways, exceeded our expectations. Five star rating.